This comfortable home sits on one of, if not the largest lot in the subdivision. The house does need some work, but presents a great opportunity to come in and put your own touches on it to make it your home. It offers a very comfortable and functional split floorplan. The layout has very little wasted space. 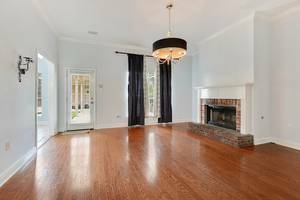 The spacious living room features a corner fireplace and hardwood floors. The master suite offers a nicely sized walk-in closet that is accessed through the master bath which boasts a dual vanity, tub and separate shower. The kitchen opens to the dining space and each have a great view of the giant backyard, as does the master bedroom. This one is waiting for you to come make it your own. This fantastic home in Central boasts an extensive renovation and now has an open floor plan with an array of amenities. The spacious kitchen, which now overlooks the living area, offers a massive center island, slab granite counters, updated cabinets, a stainless appliance package with a gas cooktop and much more. The nicely sized living room is accented with large brick fireplace. The entire home has updated paint colors, fixtures and you can find slab granite in the bathrooms, as well. Across the carport is an attached storage room along with an additional room that could have a number of uses such as a home office or workout room. 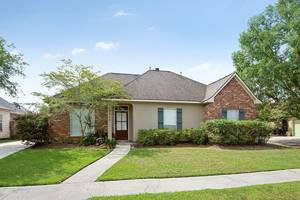 There is also a detached storage building in the comfortable sized backyard that it shaded by a beautiful live oak tree. The roof is only 5 yrs old. This place is truly move-in ready!! Better than new- less than a year old, but comes with window treatments, fridge, washer, dryer, a fenced in yard, extended patio, wood floors throughout with tile in the wet areas. All of these items set it apart from the brand new homes in the subdivision and it still feels brand new. This home features an amazing open 4 bedroom plan with none of the rooms feeling too small. The beautiful hardwood floors make a great presentation along with designer paint colors. Slab granite counters are found throughout and the kitchen also boasts an upgraded tile backsplash. The perfect location is right near all of the new shopping and eateries just off of the Juban exit. The seller is in a position to close quickly, if necessary. You won't want to miss out on this great home. Great home in Springlake Subdivision. The living room features a traditional brick fireplace with custom mantle, wood floors and offers a nice view of the back patio and yard. The kitchen has ample cabinet space and a center island opens to both the breakfast area and formal dining room. The master boasts an in-suite bath with dual vanity, jetted tub, separate shower and a spacious walk-in closet. Springlake offers a gated community park and recreation area that includes two pools (one is a small kid pool), tennis and basketball courts, playground, soccer field, walking trail and clubhouse. Prepare to be wowed by the character and extras that this home has including antique reclaimed beams & mantle, exposed interior brick columns, solid lumber baseboards, 10' and 11' ceilings and 8' doors throughout, and so much more. The kitchen features and upgraded stainless appliance package, large center island and a pantry entry way covered by sliding barn doors. The living room is accented by gas fireplace surrounded by brick and resting under the previously mentioned antique reclaimed mantle. An exquisite master bathroom has a free standing tub and an over-sized frameless glass custom shower. The kitchen area offers access and a view to the large back patio. The patio includes a custom outdoor kitchen under a beautiful natural cypress ceiling. Also included in the list of amenities offered are a custom drop/mud area, built-in chest of drawers in the spacious master closet, large utility room with cabinets and a sink, tile tub surrounds in guest bathrooms, and beautiful hardwood floors. Prepare to be wowed by the character and extras that this lake front home has including antique interior reclaimed beams & mantle, exposed Old St. Louis interior brick, solid lumber baseboards, 10' and 11' ceilings and 8' solid core doors throughout, tankless water heaters and so much more. The kitchen will feature a professional grade appliance package, large center island and loads of cabinet space. The living room is accented by a glass encased vented fireplace resting under the previously mentioned antique reclaimed mantle. An exquisite master bathroom has a free-standing tub and a frameless glass custom shower. The kitchen area offers access and a view to the large back patio and lake. The patio includes a custom outdoor kitchen under a beautiful natural cypress ceiling. Also included in the list of amenities offered are a large utility room with cabinets and a sink, tile tub surrounds in guest bathrooms, hardwood floors, LED can lighting fixtures and wood lintels over the front windows that combined with the painted exterior brick, give the home perfect curb appeal. 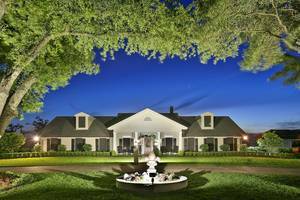 A massive tree shaded front lawn welcomes you to this beautiful property that consist of over 3.5 acres of seemingly endless amenities. 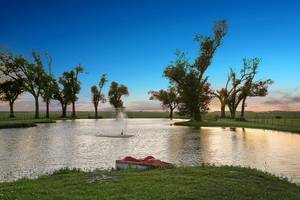 The property sits just across from Bayou Lafourche and is only an hour drive to both New Orleans and Baton Rouge. The interior boasts multiple living areas and ample storage space throughout, including a large upstairs bonus area that could be all storage or both storage and a bonus or bedroom. Other interior amenities include: hardwood floors, granite counters, updated fixtures, a large multi-jetted shower with steam capability, two TOTO smart toilets, shaded windows that allow you to see out, but hinder the view in from the outside. The list goes on and on. The exterior features a 3 car carport that sits beyond the electric gate. 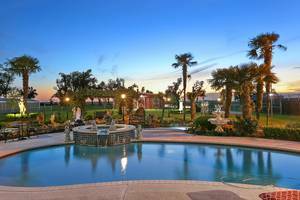 A picturesque pool and patio area that features fountains, a gazebo, lush landscaping and much more. Beyond the pool area, you'll find a shuffle board court, a 1,764sq.ft storage building/barn and a stocked pond. You won't have to worry about the power going out, as this home is equipped with a 47kw generator that will run everything on the property. The home also has four Trane A/C units, each of which control a different area. All lighting inside and out are LED. The onsite security system that includes surveillance cameras will remain. All appliances and TV's can remain. There is a 1,136 sq.ft. guest house on property that is not included in any of the square footages listed. Guest house was renting for $650/month. The guest house has a large bedroom and bath along with a very open living, kitchen and dining area. 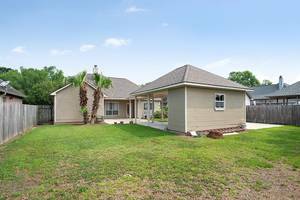 A beautiful yard and live oak welcome you to this property that sits on Hwy. 1 just across from Bayou Lafourche. Although updated in many ways, this home still maintains its old charm with its hardwood floors, antique doors and knobs and much more. It features very spacious rooms set in a very comfortable layout that you'll need to see to appreciate. Refrigerator, washer & dryer to remain. Completely updated home just off of Monterrey across from the Monterrey fire station just down from Spectrum Fitness Center. This comfortable home features a large bonus room off of the kitchen/breakfast area. Updates include: paint inside and out, roof 5 years old (30yr. architectural shingles), flooring throughout, ceramic tile tub surrounds, slab granite counter tops in kitchen and bathrooms, plumbing fixtures, lighting fixtures, hardware throughout, AC system and more. Measurements not warranted by REALTOR. This one has the old charm (design and original hardwood floors) in the midst of a complete makeover- all in a great location just off of Jefferson Hwy. between Towne Center and Government. From the house you can take a walk to BREC’s Webb Golf Course and Goodwood Park. The location is also just a short drive to Catholic High and St. Joseph’s Academy. Updates to the home include slab granite, flooring, paint (inside and out), fixtures throughout, landscaping and many more. The master offers a large walk-in closet attached to a new and spacious master bath. The kitchen is completely updated and also comes with a new stainless steel refrigerator. The formal living room is accented with a beautiful bay window that looks out to the front and has wood stain trim and plaster walls giving it its old character. The home also boasts a comfortable den area, new A/C system, new roof and much more! Beautifully updated condo right near the pool. Great location off of Summa between Essen and Bluebonnet just south of I-10. This unit has been updated with hardwood floors throughout the living, hall and bedroom. The kitchen has updated granite counters and tile back-splash with glass tile accents, as well as updated fixtures and hardware. New ceramic flooring can also be found in the kitchen along with the bathroom and dining area (currently being used as office space). No work necessary on this one, it's truly move-in ready. Information herein deemed reliable but is not guaranteed. 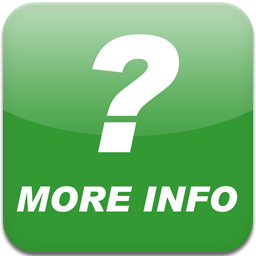 Interested parties should obtain independent property reports. Neither the listing broker nor the internet publisher shall be responsible for errors. Each office is independantly owned and operated. Licensed by Louisian Real Estate Commission.